with Hampton & Sons Ltd., London. A painting of the same subject in profle to the right is in the Bayerische Staatsgemäldesammlungen, Munich. 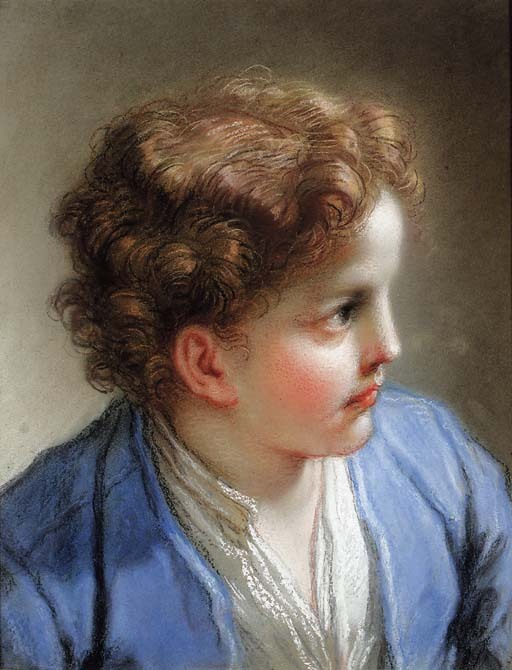 The Munich head is also closely related to a picture of similar dimensions in Leningrad, once in the collection of Sir Robert Walpole, which in 1779 passed from the Houghton Hall Collection to Empress Catherine II, E. Peters Bowron, 'Benedetto Luti's Pastels and Coloured Chalk Drawings', Apollo, June 1980, pp. 440-447. Luti may have executed this sheet, and the following lot, to be presented as gifts to a client, or as finished works in their own right. By 1700 Luti was not only a successful painter, but also one of the principal dealers on the Roman art market. He took advantage of this dual status as artist and marchand amateur to produce several of these highly finished pastels for the trade, and also as gifts to clients and benefactors in appreciation of their purchases or commissions. Luti presented two such pastels, probably likenesses of his own daughters who often served as models, to Thomas Coke, later 1st Earl of Leicester, possibly in gratitude for Coke's purchase of a painting of Rebecca at the Well, E. Peters Bowron, op. cit., p.444, exhibited London, Agnew's, Old Master Drawings from Holkham, 1977, nos. 79 and 83. Two pastel studies from a series of the heads of the apostles, similarly signed, though dated '1712', were sold at Christie's New York, 11 January 1994, lots 223 and 224.